Outpatient construction starts have come off their highs set in 2015 but are expected to rebound in 2018. Outpatient healthcare real estate (HRE) development projects totaling more than 34 million square feet were started or completed in 2017. 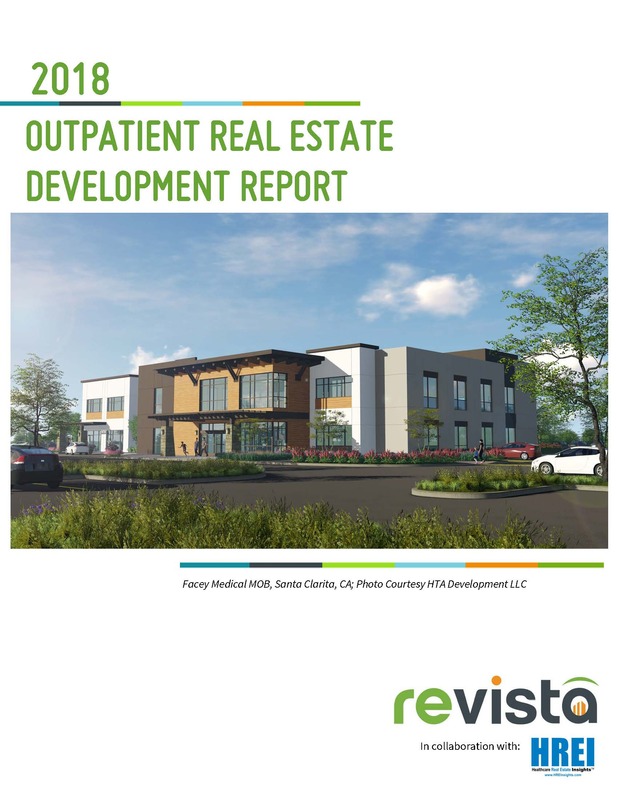 That’s according to the second annual Outpatient Healthcare Real Estate (HRE) Development Survey from the Arnold-based HRE research firm Revista. Launched last year and developed in conjunction with the Minneapolis-based Healthcare Real Estate Insights (HREI) media organization, the report is the first – and remains the only – independently verified research project to look exclusively the annual level of outpatient HRE development. The new report found that 2017 saw a slight drop in the development of medical office buildings (MOBs) and other outpatient facilities from a year earlier. A total of 34.08 million square feet of projects were started or completed last year, down slightly from the 35.69 million square feet of projects started or completed in 2016, a decline of 4.6 percent. “As the report found, the amount of square footage started or completed last year was down compared to 2016 and was also slightly less than in 2015,” adds HREI Editor John B. Mugford. In addition to a list of the largest outpatient HRE developers, the new Revista report breaks out the data between on- and off-campus development, and between projects developed by healthcare providers (self-developed) and those developed by third-party developers. It also reports on the number of projects developed, and offers comparative data from 2015, 2016 and 2017 in terms of square footage, number or projects and construction value. “Although other healthcare real estate development surveys have for many years reported on total development activity, most have not differentiated between inpatient projects, such as acute care hospitals, and outpatient projects, such as MOBs,” notes HREI Publisher Murray W. Wolf. “Consequently, it was not possible to isolate the size of the outpatient development market or to provide meaningful rankings of the largest outpatient developers. The result is the most comprehensive, accurate survey in the industry because Revista independently verifies the data contributed by the survey respondents, Mr. Hargrave notes. For purposes of the survey, outpatient projects are defined as all MOBs, outpatient surgery centers, dialysis centers, clinics, freestanding emergency rooms/departments, imaging centers, urgent care centers, retail medical buildings and other purpose-built medical buildings where outpatient care is provided. For the new HRE Outpatient HRE Development Survey, Revista and HREI solicited, collected and verified data on outpatient development projects started or completed in 2017 that exceeded $2.5 million in value and that included at least 5,000 square feet of new or renovated space. Data was gathered using surveys completed by the developers, as well as other sources. HREI magazine is featuring highlights from the survey in the cover story of its March 2018 edition. To read the cover story, please click here or visit HREInsights.com. Revista is also offering a complimentary data brief on the report. Please click here to visit and download. The full outpatient medical real estate report is available exclusively to Revista subscribers. Please contact Mike Hargrave at 443-949-8794 or mike(at)revistamed(dot)com for more information or to subscribe to the Revista service. Revista serves as a valuable, one-stop industry resource for healthcare and real estate organizations; providing comprehensive, unbiased medical real estate-focused data; healthcare industry statistics, market reports and other resources; as well as executive networking events with a focus on data. Headquartered in Maryland, Revista was founded by Elisa Infante Freeman, Mike Hargrave and Hilda Flower Martin. They previously held leadership positions in a seniors housing industry organization, whose mission is to advance the quality of senior housing and care through the research, resources and events they provide. These Principals have decades of experience in healthcare real estate. They collaborate with an industry-leading advisory board and with founding partners that are well-known companies in the healthcare real estate industry. For more information, please visit RevistaMed.com. Launched in 2003, Healthcare Real Estate Insights™ (HREI™) was the first and remains the only national media organization entirely dedicated to covering healthcare real estate (HRE) development, financing and investment. This monthly, national, business-to-business print and digital magazine offers sophisticated players the most comprehensive coverage in the industry available anywhere. HREI’s other HRE sector innovations include the HREI Insights Awards™ (introduced in 2013), the first and only comprehensive awards program recognizing excellence in HRE development and executive leadership; the HREI Resource Guide™ (launched in 2008), the first and only annual directory of HRE services; and HREI’s companion website, HREInsights.com, with more than 15 years of content, including more than 5,500 articles, news releases, property listings and other postings, and is the undisputed hub of HRE news and information. In 2016, HREI also launched its widely read HREI weekly e-newsletter. To sign up for the free e-newsletter, please click here. For more information on other HREI products and services, or to subscribe or advertise in print or online, please visit us at HREInsights.com.